Netforum provides software for association management and allows you to build pages using a WYSIWYG editor or from HTML directly. Navigate to Modules > Websites > Web Content > List Web Content. From the list, find Event Reg - After Submit for the appropriate Website (usually the name or acronym of your association). It's possible that your flow does not use this page. If not, find the appropriate post-reg page. Clicking Event Reg - After Submit will pop open a new page containing the editor. Click on Source to view the page's HTML. Paste your Feathr Super Pixel before the closing </body> tag. Save the editor and the window will close. It is also recommended that you place the Super Pixel on pages before registration to facilitate Cart Abandonment campaigns and to have greater visibility into your users' activity. The easiest way to know what URL(s) to use in Feathr to build your reg confirmation audience is to make a 100% discount code and step through reg. 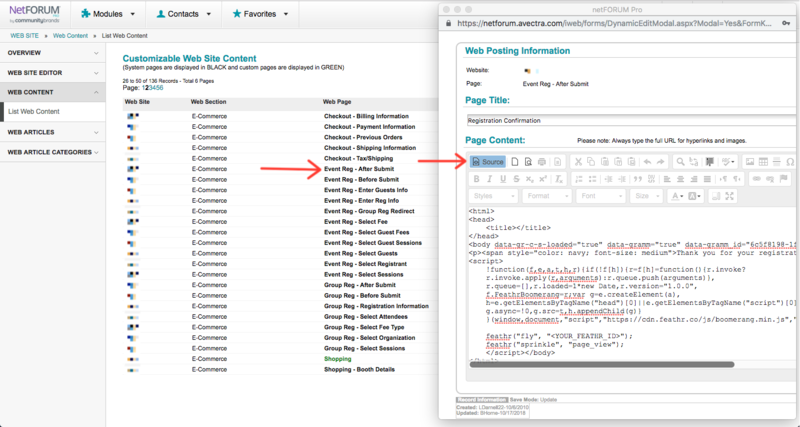 Take note of the URL you see on the last page and search for it in Feathr's Explore workspace. This does not block Feathr from being able to track registrations as preceding and following pages are usually enough.